On Monday 2/20/2012, G.P. 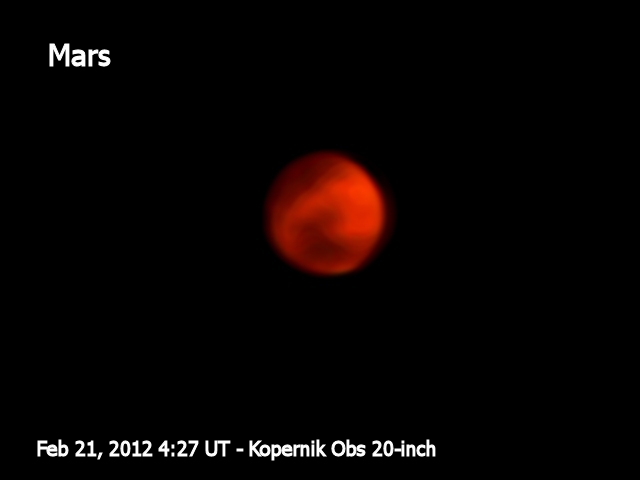 Normandin and A. Cacciola set out to take some images of Mars during a KAS Only observing session. Sounds like they had a great night of observing and they capture some data too! Image shows some surface detail and shading. This is a “quickie” processing job on some Mars data taken Monday night using Kopernik’s 20-inch, a Brandon 2.4x Barlow, and a webcam (Celestron NexImage).